Let’s (not) take the kids for a day on the (US industrial beef) farm. Those little black and whitish specks that look like ants on the left? Cows. That enormous acid green pool of slime to the right? No idea. But I know this: there is something terrible going on with our food production in this country. It’s poisoning us and it’s poisoning the environment. I can’t imagine any of those poor cows are too psyched about it either. 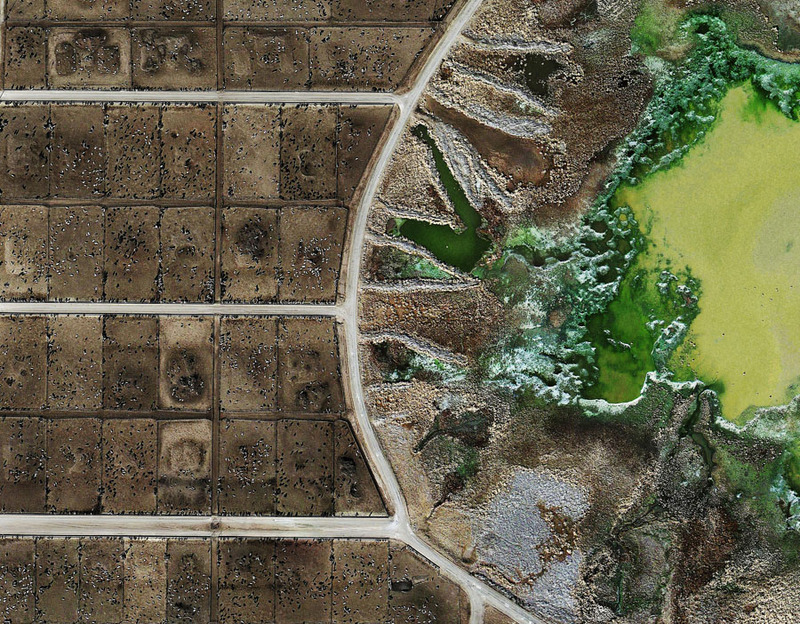 But wait, there are many more horrifyingly fascinating aerial views of America’s heartland shot by photographer Mishka Henner at his website. Take a look here. I dare you. When you’re done please join me at the paragraph below. Done? Ok. I’m sure we can all agree that no kid (or cow) should ever have to spend the day on any of those farms. And I consider myself a kind of casual, quasi-expert on this farm thing after having lived on a beautiful New Zealand farm where happy cows grazed in wide open pastures with no slime in sight. So me, myself and everybody else, let’s choose to rethink our purchases. Let’s choose to rethink our family’s diet. Let’s choose to buy grass fed beef, locally farmed if at all possible. It’s usually less convenient and definitely more expensive so let’s just buy less of it. Or none at all. If ever we could collectively be inspired to become organic farmers, vegetarians or vegans it should be right now… as we sit here staring at all those little American cow-ants imprisoned on the shores of Lake Slime. The World We Made… it’s enough to make you throw your recycling bin in the trash can. Or is it? A must read by Jonathon Porritt. While scientists and environmentalists are well intentioned with their daily projections of our not so distant future dystopian world order and subsequent extinction it can put a real damper on the day. The struggles of our grandparents can seem downright quaint in today’s post climate change world… the age old mantra “life goes on” a phrase twenty somethings of today might wear ironically on their t-shirts. Can you blame them? The daily challenge of survival is no longer limited to ourselves as individuals, our individual communities or even entire populations but now encompasses every last one of us, including all future generations and/or the lack thereof. It’s enough to make you throw your recycling bin in the trash can. The answer? I have no idea. 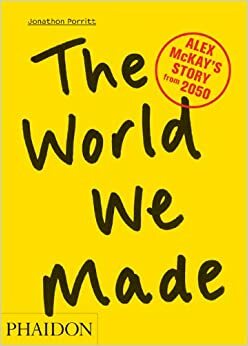 But I am inclined to think that a very good start would be for all of us to run to the bookstore or the internet and grab a copy of The World We Made, an imaginary memoir written in the year 2050 by history teacher Alex McKay. The author, Jonathon Porritt, who just returned from the World Future Energy Summit in Abu Dhabi is a founding member of The Forum for The Future, an environmentalist and no lightweight in the scientific and technology community. This green futurist believes that we already have the technology to create a sustainable, progressive world in which environmental, economic and social advances are shared, maintained and enjoyed by all. The catch? We must also believe that this is doable. It’s fundamental. If we don’t collectively believe that it is doable it simply won’t get done. I’m in. I’m gonna get the book. And I’m gonna believe. How about you? Buy the book here. Read an interview with the author here. How to convey the terrifying machine that is the Koch brothers in fun size. Yeah, yeah. I know the Koch brothers are bad guys. I know they’re oil guys. I know they’re bajillionaires. But, like a lot of us, do I really understand all the what, where, why and hows? Admittedly, I do not. And that’s exactly how the Koch brothers want it. Ignorance, after all, is bliss. Unfortunately bliss, in this case, is theirs alone. So I did a little research on them. In a nutshell, here is what I learned: every single person on this planet needs to understand exactly what this two headed monster is doing to every single one of us every single day – and we need to understand now. It’s common knowledge that in this fast paced, digital world we are more likely to read or engage in something that is bite size and easy to digest. We prefer bullet points to paragraphs, the synopsis to the full story. We want to be briefed. And that brief had better be brief. That being said, what better way to grab the world’s attention and help get the word out on these guys than with a quick, clever blurb paired with a single, yet powerful, image? Which leaves me in the conundrum of how to convey that terrifying machine that is the Koch brothers in fun size. A conundrum in which I must remain as it is simply not possible to cut to the chase on these guys… their reach is that vast, their targets that permeated, their influence that prolific. So in order to have a rudimentary understanding of who is ruining everything for everybody and how they are doing it you are going to have to watch this extremely insightful and equal parts frightening FULL LENGTH (that means 55 minutes!) documentary. And this is just the tip of the iceberg. So belly up and hit the play button because if ignorance is bliss, knowledge is power. And we’re gonna need a whole lot of that if we’re gonna have a fighting chance against these two. Frack. Such a dirty word. We should really be replacing that lone vowel with an asterick. Forget f*ck (so passe), the new expletive (as inferred by Rolling Stone magazine, Bill McKibben and hopefully one day extremely soon our President) is fr*ck. To be used as any other expletive, for example: fr*ck you, fr*ck me, fr*ck that. Now read the fr*cking article Obama and Climate Change: The Real Story as featured in Rolling Stone Magazine. My dear old friend Susanna featured Long Live Earth on her nifty blog. Lots of great pics and products for young and old to be found at Susanna’s Paper Oranges. Click her big Sourpuss to get from here to there. Thanks Susanna! She hasn’t changed a bit. Can it really be 20 years since Long Live Earth was first published? The first time around I wanted this book to make a difference. Judging from the thoughtful letters that I received from kids all over the world (who are now, no doubt, progressive thinking young adults like my son Ben, now 24) I believe it did.